A recent post on Instagram about my rescue puppies – Egglet and Belly Dog, received a lot of interest from one of our incredibly generous donors. I realised I hadn’t shared their story, so in a brief moment of down time, I’ve decided to do just that. Early January 2016 I awoke to the sound of squealing at my doorstep. I opened the door to find a rough rice sack, loosely tied shut. The sack was wriggling around and my heart sank as I opened the bag and saw my initial fears were realised. There were four tiny pups inside the sack. Three years ago, I started Panama Dog rescue in the hope I could provide a safer environment for stray dogs and setup spay clinics to prevent more unwanted dogs from being born. The charity has, so far, been a success, despite limited funds and support. 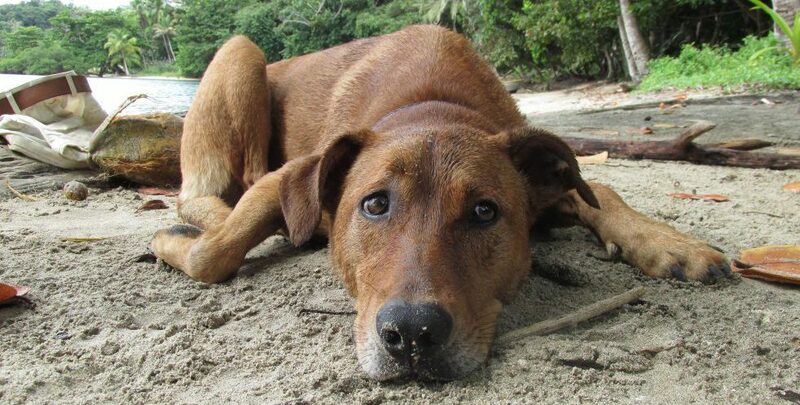 Within the local community in the Portobelo National Park, northern Panama, I am known for my work with dogs. People approach me on a daily basis to ask for tips and advice to maintain the health of their dogs. I do whatever I can, within the networks I am creating, to provide care whenever possible. Which I suspect is why I woke up to a sack of puppies. They were desperately malnourished and mange infested. Their fur was non existent and skin red raw. They had been removed from their mother too soon and I suspect she had probably suffered greatly trying to keep her pups alive. I wrapped them in blankets and began to hand feed them but two of these beautiful, tiny creatures were too weak to carry on. I stroked them as they passed away. It was heartbreaking. I focused my efforts on the remaining two. It took several weeks of around the clock, intensive care to bring the pups back from the brink. As they grew stronger, they began to respond to the mange treatment, allowing them to grow fur and finally keep themselves warm at night and protect their skin from the fierce sun through the days. Thanks to the incredible generosity of our supporters, I was able to buy replacement milk, high nutrient food, and medicine for mange and worming. Your support meant I could finally see them Belly Dog and Egglet thrive. It was an incredible moment for me. With good health care their personalities began to bloom and soon they were beautiful bundles of energy that I could finally consider finding a home for. Fortunately for me, a good friend of mine, a landscape gardener who lives locally, was enamoured by the pups and decided to take them both on. It means I’m able to see them regularly and keep track of their progress. Belly dog and Egglet are perfect examples of why I do what I do here in Panama. It’s hard work and occasionally heart breaking. But I’m rewarded every day when I see these animals live when they would otherwise starve, die of disease, or be killed. We, (The dogs and me), couldn’t do this without your support so would like to Thank you for taking the time to read this. Previous Post Better late than never…..